● Is cormorant fishing performed every day? It is performed every night during the cormorant fishing period from May 11 to Oct. 15 every year, excluding the cormorant fishing holiday (usually one day in September or October) and the day when cormorant fishing is cancelled due to a rise in river water. ● When does cormorant fishing start and end? Please see this page for the schedule on any given day. The ending time differs by event or the number of boats. It usually ends between 20:30 and 21:00. ● What is Noryo (enjoying cool breezes on the river) cormorant fishing? 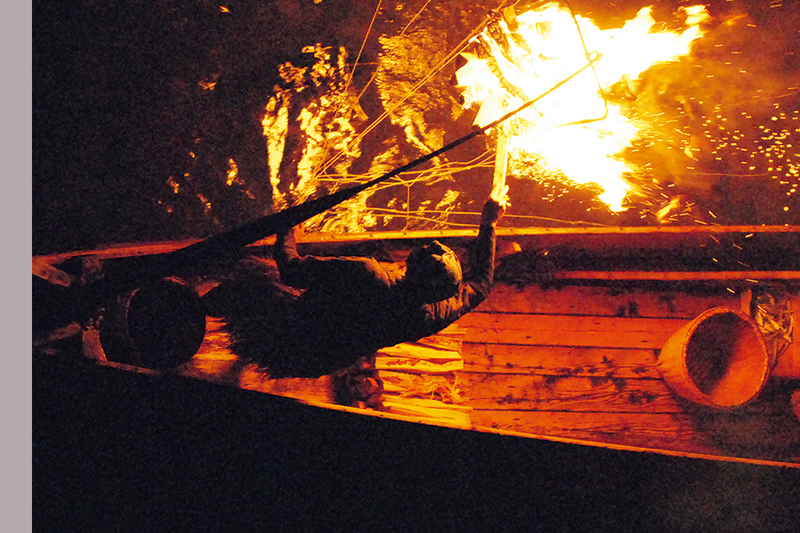 It refers to cormorant fishing performed twice a day on Saturdays in July to September. Visitors for the second-round boat will observe cormorant fishing from around 21:10 after the first cormorant fishing is completed. The second-round cormorant fishing will end around 22:00. ● Is cormorant fishing performed on rainy days? Observation boats have a roof and cormorant fishing is performed on rainy days. However, it is cancelled when the river rises due to heavy rains, etc. ● Is it possible to observe cormorant fishing even if we do not get on an observation boat? 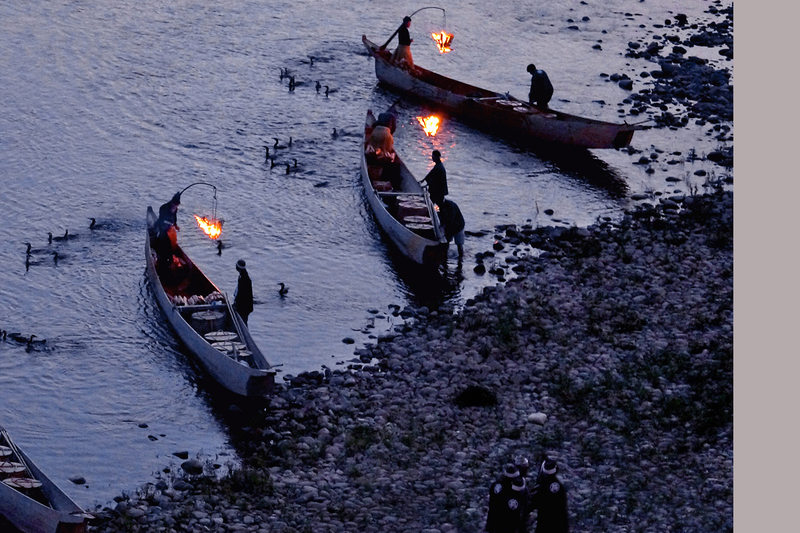 Yes, you can observe Ubune (cormorant boats) going down the river with their burning watch fires from bridges and the riverbank. ● Are pamphlets in foreign languages available? Yes. We will provide pamphlets in English, Chinese (traditional, simplified), and Korean on acceptance of boarding or when boarding. Please feel free to ask us for a pamphlet in one of these foreign languages. Free Wi-Fi is available at and around the Cormorant Fishing Observation Boat Office. ● When is the recommended season for observation? There are many visitors from mid-July to mid-September every year and it is a very crowded season. The recommended seasons are June and the end of September. At these times, there are not as many observation boats and the climate is more comfortable. It is therefore perfect for cormorant fishing observation. In May and October, it may be a bit chilly. ● How can I make a reservation? ・A chartered boat requires reservations in advance. Please make a reservation by phone. ・If you plan to use a shared-ride boat, we recommend that you make a reservation in advance. If there is a vacancy on the current day, you may ride on the boat. ・Reservations are available by phone or through the Internet. Please make your reservation here. ● Is a meal included in the price of the boat? When you make a reservation at the Gifu City Cormorant Fishing Observation Boat Office, a meal is not included in the price in normal cases. Please arrange your own meal. Any food and beverages can be freely brought onto a boat. ● Is there a cormorant fishing observation plan including a meal? 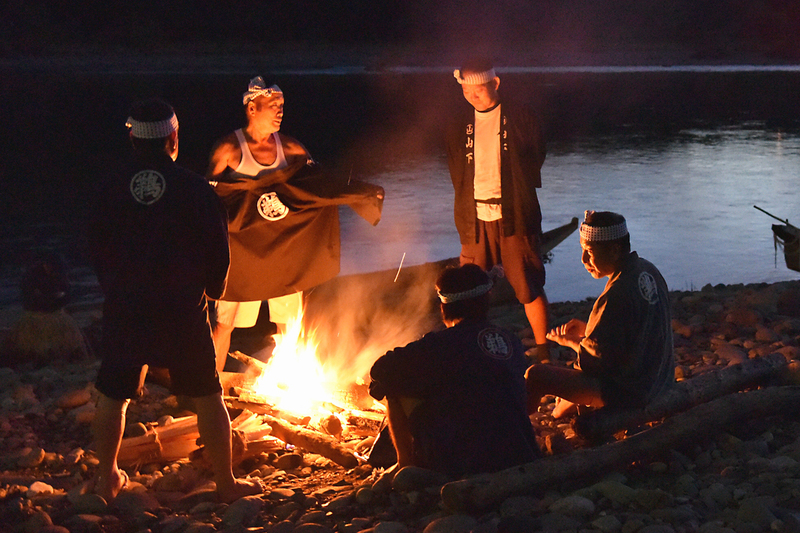 Accommodations along the Nagara River provide a cormorant fishing and accommodation plan in which accommodations, cormorant fishing observation, and meals are included. There is also a day trip plan which is available for visitors who will not stay in accommodations. For more details, please contact the accommodations directly. 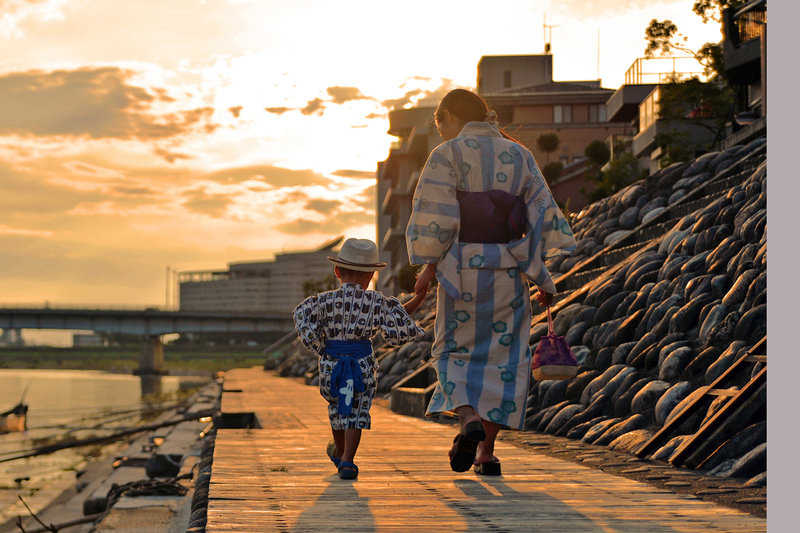 ● Can I buy food and beverages at or around the boarding point of the observation boat? No food and beverages are sold at or around the boarding point of the observation boat. Please purchase before boarding. ● We have a big company. Observation boats are available for groups of 15 persons up to a maximum of 50 persons. Please reserve a chartered boat depending on the number of people. ● Is there a toilet on the cormorant fishing observation boat? Some of the observation boats have a toilet. ● Can I ride on the observation boat with my pet? No. No pets are allowed on the boats. ● Can I use a credit card? Yes. Visa, American Express, MasterCard, JCB, Diners, and China Union Pay card are accepted. We accept one-time payments only. ● Is there a discount program? Yes. There is a discount program for shared-ride boats.For more details, please visit this page. ● Where can I ride the cormorant fishing observation boat? Please come to the Gifu City Cormorant Fishing Observation Boat Office. For more details on access, please visit this page. ● Is there a parking lot? Yes. There is a municipal parking lot nearby. Please feel free to use it. ● How can we reach Gifu Station after the cormorant fishing is over? Buses are operated from the nearest bus stop “Nagara-bashi” to JR Gifu Station and Meitetsu Gifu Station respectively until shortly after 22:00. For more details, please check the Gifu Bus website. What is Cormorant Fishing on the Nagara River? 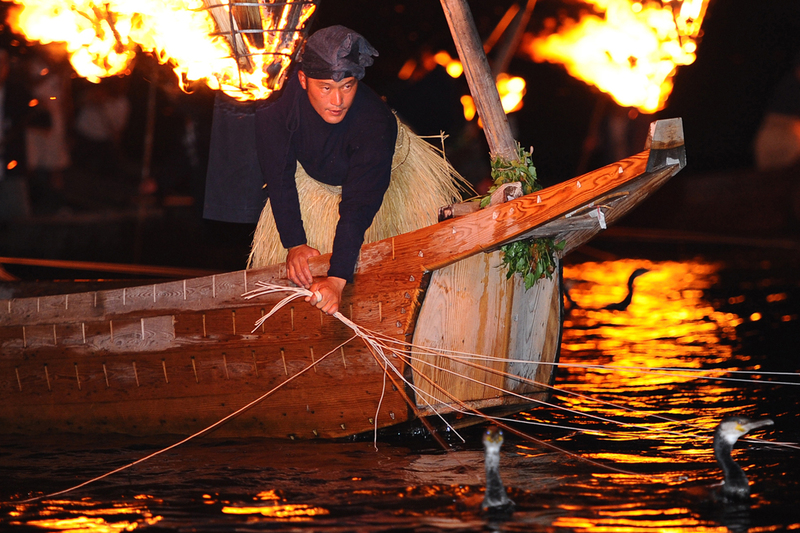 Let’s help make Cormorant Fishing a world intangible cultural heritage! © 2019 Gifu Cormorant Fishing on the Nagara River. All Rights Reserved.